← Chance Meeting, Making Contact and a Cool Tip..
Back To The Bassline.. Simple Yet Effective! 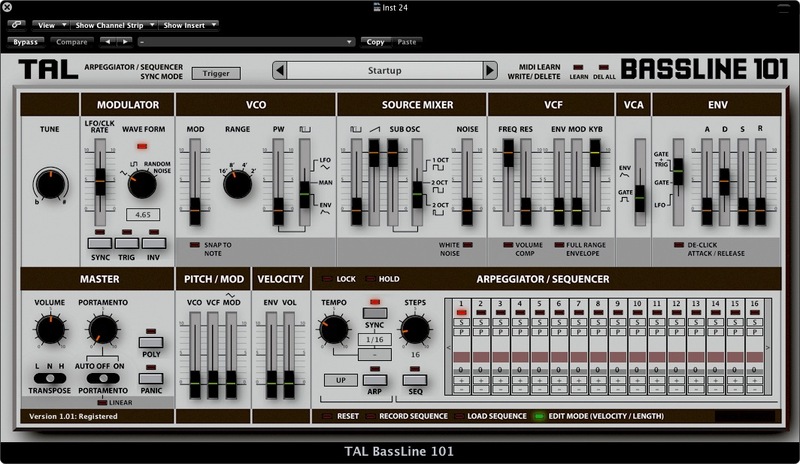 Now the origins of the Bassline 101 plugin obviously belong to the Roland SH-101 and looking over the original feature set it quickly becomes clear that these guys have meticulously gone to great lengths to replicate the hardware offerings controls and functionality..
Now, as some of you may have figured out by now I don’t write the kind of reviews that go into technical details to the point of obsessive scientific comparison, measuring eq curves, harmonics or any of that audio voodoo mumbo jumbo so popular with people who often seem to just enjoy finding minor faults and criticising, or else they geek out so completely over stuff that they forget to actually make any music and enjoy the wonderful tools that are made available to us these days. So instead I will tell you straight as a person who likes to get creative, get stuck straight in, who doesn’t want to read a manual until I’m stuck with something, just wants to open the plugin flip through some presets, tweak around, mess with it and feel whether the thing works or not, is it usable?, does it inspire any ideas straight away? Throw it into a track and get it on.. will it work for me? The Basslines… Well what can I say, the sequencer section is easy to use, right away you can make some really cool stuff happen. From modern experimental arpeggio tones and dance music fuzzed out mayhem all the way back to classic acid house fuelled sequenced bass, there’s enough controls here to shape and twiddle away until you fashion something funky, but at the same time there is not too many controls that you become overwhelmed..
A good balance, those guys at Roland sure knew how to build a synth, in turn the guys at TAL have been smart enough to stick to the script and so also manage to deliver something special here in my opinion.. Similar to the TAL UNO-X which I also use, I find the sound and tone on offer here is easily on par with offerings from much bigger names in the plugin world and way more expensive products out there available today.. In short, this instrument rocks, it sounds good, it’s easy to use (which is important to me) and at such an amazingly fair price.. Imagine explaining that this sort of product would even be available back when people splashed the cash on the hardware edition and could only have one instance available without instant recall? 4 Responses to Back To The Bassline.. Simple Yet Effective! Oops.. Corrected typo.. Thanx. Zz. While it sounds very good and feels very realistic of the original beast, I cannot stop wondering why it doesn’t have a bit more modulation options. Especially a 2nd ADSR ENV. Yes, it would modernize it, and -gasp- that would be a sacrilege, etc… yada, yada. But then why the arpeggiator/sequencer? Same goes with their Juno simulation. Sounds good, realistic, yet a little bit limited to what they could be. Different strokes for different folks I guess? , I really like the simplicity of it but do understand your comments, I can say I’ve been using this nonstop since I got it though and really enjoying it, does what I does very well IMHO.. Making it’s way onto tracks easily. Zz.